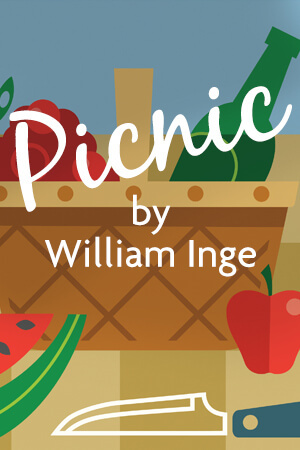 The NIU School of Theatre and Dance will be performing Picnic, written by William Inge. This 1950’s romance will open on March 23 at the Diversions Lounge in the Holmes Student Center, 340 Carroll Ave in DeKalb. First written and performed in 1953, Inge’s play tells the story of a drifter named Hal making his way through Kansas. He stops in a small town to work for Helen Potts, an older woman in town. He becomes reacquainted with his old college friend, Alan Seymour, and winds up falling in love with Alan’s girlfriend Madge Owens. Madge is a young 18-year old, who deals with finding her identity outside of being labeled the “pretty one,” while her sister Millie attempts to escape the shadow of her sister. Throughout the show, Inge creates a strong dynamic amongst the characters using themes of identity and sexual awakening. Inge is a Pulitzer-Prize winning playwright and novelist whose works generally contain solitary characters who constantly battle with their sexuality and relationships. “The show will move you,” Destiny Dunn, who plays Madge, added. Performances will be held at NIU’s Holmes Student Center, in the Diversions Lounge, 340 Carroll Ave. in DeKalb. Show times will start at 7:30 p.m. Thursday-Saturday and 2 p.m. on Sunday. An additional afternoon performance will be presented at 2 p.m. on Saturday, March 25. Tickets are $7. Ticket reservations and additional information are available by contacting the NIU School of Theatre and Dance box office at 815-753-1600.